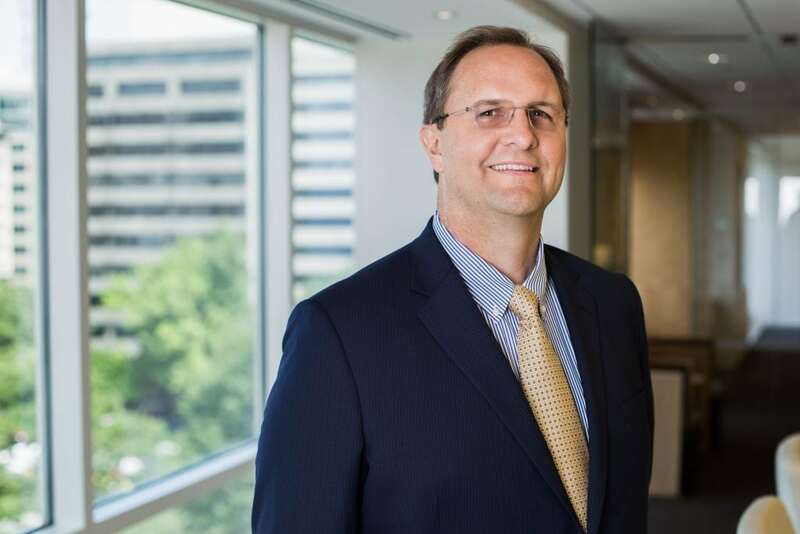 Timothy W. Riffe is a Principal in the Washington, D.C., office of Fish & Richardson. His practice emphasizes post-grant proceedings before the U.S. Patent Trial and Appeal Board (PTAB), patent litigation, strategic patent counseling and prosecution. Mr. Riffe has experience representing both patent owners and petitioners in inter partes review and covered business method review proceedings before the PTAB. Mr. Riffe’s extensive litigation and prosecution/counseling experience combined with his post-grant practice allows Mr. Riffe to bring a wealth of knowledge across multiple disciplines within the intellectual property field to bear on his clients’ behalf. He has handled technical matters in such diverse fields as semiconductors, medical devices, power generation, disc drives, beverage dispensing, telecommunications, oil refining processes, software, and toys. Mr. Riffe assists in the management of patent portfolios for a variety of large and small technology clients. Mr. Riffe’s services include patent portfolio strategy and development, opinions on patent validity and infringement, patent landscape and freedom to operate (right to practice) studies. As noted above, Mr. Riffe also has extensive patent litigation experience before the U.S. International Trade Commission and Federal District Courts. By way of example, Mr. Riffe’s cases have involved VoIP, disc drives, semiconductors, video displays, computer peripheral devices, baseband processor chips, and interface circuits. Prior to his legal career, Mr. Riffe worked as a design and process engineer for Michelin Tire Corporation and DuPont. Member, Advisory Board of The Children’s Law Center, Washington, D.C. Co-author, “9 Common Pitfalls With Post-Grant Proceedings, Law360 (2014).” Co-author, “Recent Legislation: The American Inventors Protection Act of 1999,” Bio-Science Law Review 3: 93-98 (1999). Co-author, “Proposed Changes In US Patent Regulations May Impose Increased Burdens With Respect To Information Disclosure Statements,” Bio-Science Law Review 3: 123-25 (1998). Co-author, “Status of Legislation To Reorganize The US Patent And Trademark Office And Amend US Patent Law,” Bio-Science Law Review 2: 78 (1998). Consero Group’s “Post-Grant Executive Roundtable” (September 2014). “How the Use of Discovery is Evolving in Inter Partes Review Proceedings,” Fish Post-Grant for Practitioners Webinar Series, (June 12, 2013). “The New Age of Enforcement: Post-Grant. How to Avoid Being the Victim When Asserting Your Patents,” The IP Strategy Summit: Enforcement, Washington, DC, (May 29, 2013). MLC Intellectual Property, LLC v. Micron Technology, Inc. (N.D. Cal.) Representing defendant, Micron Technology, Inc., in case involving memory devices. EMS Technologies, LLC v. Micron Technology, Inc. and IM Flash Technologies, LLC (E.D. Tex.) Representing defendants, Micron and IMFT, in case involving memory devices. Sling Media, Inc. v. Belkin International, Inc. and Monsoon Multimedia, Inc. (N.D. Cal.) Representing plaintiff, Sling Media, in case involving devices having placeshifting or display replication functionality. Case settled. The Board of Trustees of the University of Illinois v. Micron Technology, Inc. (C.D. Ill.) Representing defendant, Micron Technology, in case involving semiconductor devices. Case stayed pending resolution of inter partesreview proceedings. Mitel Networks Corp. and Mitel (Delaware), Inc. v. Facebook, Inc. (D. Del.) Represented the Mitel plaintiffs in case involving web-based services and products. Case settled. Virnetx Inc. v. Mitel Networks Corporation, Mitel Networks, Inc. et al. (E.D. Tex.) Represented Mitel defendants in case involving virtual private networks and domain name services. Case settled. LeRoy G. Hagenbuch v. Komatsu America Corp. (C.D. Ill.) Represented defendant, Komatsu America, in case involving earth-moving equipment. Case settled. Innovative Global Systems, LLC v. Komatsu America Corp. et al. (E.D. Tex.) Represented defendant, Komatsu America, in case involving data communications between heavy duty vehicles and remote terminals. Case settled. Condatis LLC v. Windrock Inc. (E.D. Tex.) Represented defendant, Windrock Inc., in case involving real-time management of powered vehicles. Case settled. Microsoft Corporation v. Primax Electronics Ltd. – (N.D. Cal.) Represented plaintiff, Microsoft, in case involving computer peripheral devices. Case settled. Computer Cache Coherency Corporation v. Intel Corporation – (N.D. Cal.) Represented defendant, Intel, in case involving interface circuits. Obtained summary judgment of non-infringement. Seagate Technology LLC v. Cornice, Inc. – (D. Del.) Represented plaintiff, Seagate Technology, in case involving technology contained in micro-disc drives. Case settled. DataTreasury Corp. v. J.P. Morgan Chase & Co. et al. – (E.D. Tex.) Represented defendant, ACS, in case involving document imaging and storage systems. Case settled. Genesis Microchip (Delaware) Inc. v. Media Reality Technologies, Inc., et al. – (N.D. Cal.) Represented plaintiff, Genesis Microchip, in case involving display controller chips. Obtained summary judgment of infringement. Certain Electronic Devices Having Placeshifting or Display Replication Functionality and Products Containing Same (USITC 337-TA-878) – Represented Complainant Sling Media, Inc. seeking exclusion of placeshifting devices imported by Belkin International, Monsoon Multimedia, and C2 Microsystems. Certain Flash Memory Chips and Products Containing Same (Inv. No. 337-TA-735) – Defended respondent Samsung Electronics against patent infringement claims brought by Spansion LLC seeking exclusion of Samsung’s NAND Flash Memory Chips and downstream products containing those chips manufactured by Samsung and Samsung customers. Certain Electronic Devices Having Image Capture or Display Functionality and Components Thereof (USITC 337-TA-672) – Represented complainant, LG Electronics, Inc., in investigation involving digital cameras. Case settled. Certain Peripheral Devices and Components Thereof and Products Containing the Same (USITC 337-TA-654) – Represented complainant, Microsoft Corporation, in investigation involving computer peripheral devices. Case settled. Certain Semiconductor Chips with Minimized Chip Package Size and Products Containing Same (III) (USITC 337-TA-630) – Represented respondent, Ramaxel Technology Ltd., in investigation involving small-format BGA semiconductor packages and products containing such packages. Certain Baseband Processor Chips and Chipsets, Transmitter and Receiver (Radio) Chips, Power Control Chips, and Products Containing Same, Including Cellular Telephone Handsets (USITC 337-TA-543) – Represented intervenor, LG Electronics Mobilecomm USA, in investigation involving baseband processor chips, which are components of cellular telephone handsets. Certain Disc Drives, Components Thereof, and Products Containing Same (USITC 337-TA-516) – Represented complainant, Seagate Technology LLC, in investigation involving technology contained in micro-disc drives. After first day of trial, settled favorably after respondent agreed to cease manufacture of accused products. Certain Display Controllers and Products Containing Same (USITC 337-TA-491) – Represented complainant, Genesis Microchip, in investigation involving digital scaling and multiple display format controller chips. Obtained exclusion order after full hearing on the merits barring all accused products from entry into the U.S.
Certain Display Controllers With Upscaling Functionality and Products Containing Same (USITC 337-TA-481) – Represented complainant, Genesis Microchip, in investigation involving flat panel controller chips. Obtained exclusion order after full hearing on the merits and review by the Commission barring all accused products from entry into the U.S.